For the second time this week, I have woken up to a white blanket of snow in Vegas. Who said we don’t get seasons here? But… I am more than ready for the 100+ degree temps lounging by the pool or even relaxing in the lazy river at Wet’n’Wild Las Vegas. But since it seems we are far away from that, here are some of my favorite ways to keep warm this winter. 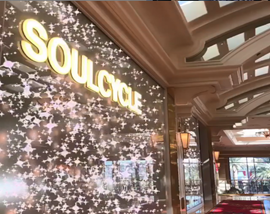 It is no secret that I am a SoulCycle addict and I waited patiently for years for a studio to open up here in Vegas. If you ask me, there is no better way to warm up than a heated dark room with flashing lights, loud music and someone yelling at you to push yourself. 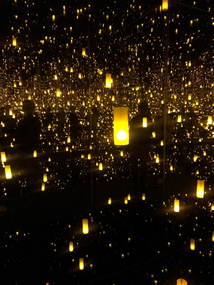 Probably one of the most Instagrammable places in Vegas, Yayoi Kusama’s Infinity Mirrored Room. The room consists of mirrors and LED lights to create a mesmerizing experience. Photos do not do it justice. Turns out it will be a great way to stay cool in the summer as the exhibition has been extended into the summer. Don’t forget to grab lunch or dinner at Spago after the gallery to see the world-renowned Bellagio Fountains – from inside! Bellagio Resort – 3600 S. Las Vegas Blvd. Nothing beats hot whirlpool on a cold day. 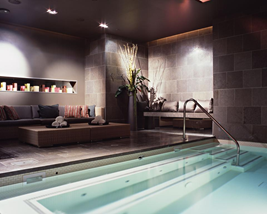 Vegas offers some of the most amazing and luxurious spas in the world and I love to treat myself and take advantage. Check out certain spas for awesome locals discounts, MGM, Red Rock Resort, M Resort, among others offer locals pricing. 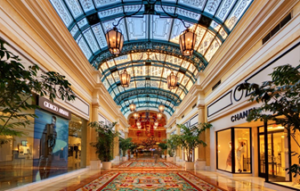 Las Vegas is known for its world-class shopping and it is easy to get lost window shopping at some of the city’s high-end retailers. For more affordable and attainable shopping, you can’t beat the Fashion Show Mall. Some of the mall’s restaurants also offer great views of the Strip. For window shopping, nothing beats Crystals and Via Bellagio, walk around and dream about what you’ll buy when you hit it big at the casino! It’s no secret the Vegas Golden Knights have taken the city by storm (no pun intended). 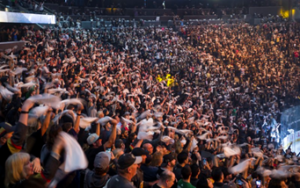 It may be a little chilly inside, but T-Mobile Arena offers perfect relief on a winter evening. It’s easy to warm up while cheering for the home team. Who said Vegas doesn’t have hockey weather? Sometimes even the trusty office sweater can’t do the trick and keep you warm. The best office essential ever is a small space heater. Whether it is next to or under your desk, it’ll make the freezing office much more comfortable! A space heater is an all year essential, even in the summer when the air conditioning is blasting.